I mentioned last week that Costco was having special TV deals for Black Friday that were going to be a surprise. For my faithful readers I was able to procure the list of pricing for these deals, and even better, they started today. That means you don’t need to wake up early Friday to get your discounted TV. The prices aren’t earthshattering, but you do get Costco Tech Support (via phone), and can purchase a SquareTrade warranty with it if you’d like. When possible I have linked to the Costco.com page for the TV so you can see the description and specs on them. I wouldn’t buy online if you can avoid it, since you will have to pay an extra $80 or so for Shipping and Handling. I have also posted the whole Black Friday ad and the November coupon book if you’d like to see those. At Costco, you have to pay tax on the Original Amount… For Example if you buy the UN55ES7150 you pay sales tax on 2544.99 then the “Rebate” of 1000 is applied. I just left the store without one because of this. 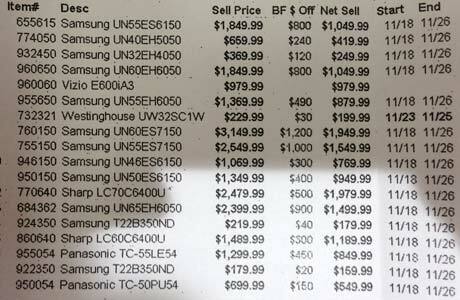 The Samsung UN55ES7150 has been at this “sale” price for a couple weeks! This can’t be the black friday prices!! !